Bowling Syndicate Strike It Rich With Huge Lottery Jackpot > Jackpot Winners Stories BOWLING SYNDICATE STRIKE IT RICH WITH HUGE LOTTO WINNINGS! 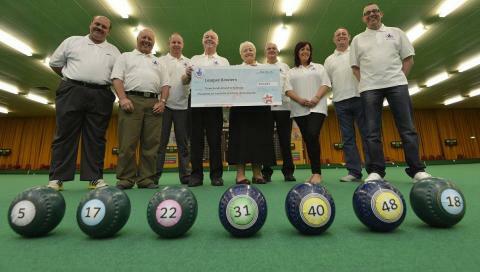 BOWLING SYNDICATE STRIKE IT RICH WITH HUGE LOTTO WINNINGS! Let's face it, we all play the lottery looking for huge lotto winnings. There's the fun, the excitement, the adrenaline, but at the end of the day, it's all about finding those huge lottos, and winning huge jackpots to boot! That's exactly what a syndicate of bowling friends from Hartlepool, England did recently, when they scored a win of over £300,000 on a recent Lotto draw - going to prove that the group that plays together, wins together! These days we seem to be reading more and more stories about lottery syndicates cleaning up in the huge lotto stakes. Whether it's to do with people wanting to split the cost of their tickets, increase their chances of winning or share the huge lotto love with family and friends, syndicates are becoming an increasingly popular way of not just playing the lotto, but of winning it too. That's exactly the experience that a group of bowling friends had recently, after winning a huge £343,643 in the UK National Lottery. Made up of nine friends and appropriately named League Bowlers, the syndicate was able to match five numbers and the Bonus Ball for a win of more than £38,000 each! This team of amateur bowlers from Mill House Bowls Club in Hartlepool haven't just been playing bowls together - they've been playing for huge lottos together too, having formed their syndicate back in 1994. And now, almost 20 years later, their love for the game has paid out huge lotto dividends - so much so that many of the members were in shock when the good news was revealed. Plans for the money are still tentative at the moment, but travel is on the cards for many of the syndicate members, as is a future free from financial worries. As Quinn says, "The win won’t change any of us – we’re all still going to stay in work, stay bowling and stay playing the lottery every week – but without any financial stress hanging over our heads.” Amen to that! As a member of GiantLottos.com, you already know that you can play to win huge international lottos as an individual - but did you know that you can play as part of a lottery syndicate too? That's right - just sign up with your colleagues, family or friends, and you can buy syndicate tickets into the Powerball, Mega Millions or EuroMillions lotteries - and increase your chances of winning huge lottos at the same time! Don't miss out on a golden winning opportunity - one in every four jackpots is won by a syndicate, so put yours together and sign up to win huge lottos with GiantLottos.com today!